Episode 35 Assyrian (?) and English. Belphegor is a demon. 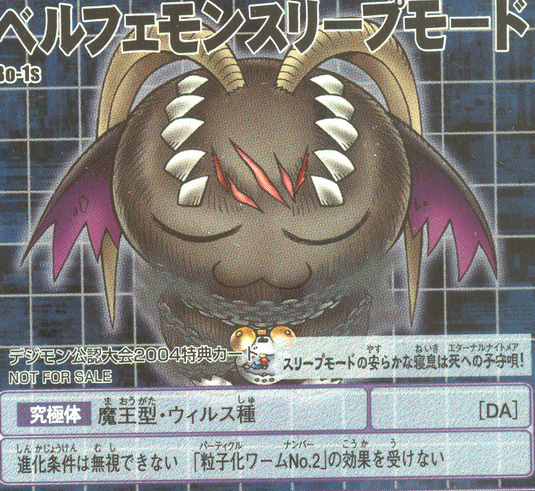 Sleep Mode, because Belphemon is said to sleep for a thousand years, and this is a card of, uh, when he sleeps. At the end of your turn, send this card to the Dark Area. Sleep Mode's peaceful breathing is your Eternal Nightmare! His evolution requirements cannot be ignored. Particle Worm No. 2 has no effect. When you evolve into this Digimon, you regain 40 points. During the battle, you may send Belphemon Sleep Mode to the Dark Area and place a Belphemon card from your hand into the Digimon Box.